§ 2217a Power to administer oaths, examine witnesses, or require production of books, etc. § 2237 Use of field work funds for employment of men with equipment, etc. 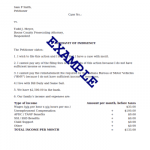 § 2247a Farm or food products; sale of samples, practical forms, etc. § 2255 Membership in International Wheat Advisory Committee, International Sugar Council, etc. Attorney-at-law: A person who is legally qualified and licensed to practice law, and to represent and act for clients in legal proceedings. Federal prosecutor: A lawyer appointed by the President in each judicial district to prosecute and defend cases for the federal government. Voice vote: A vote in which the Presiding Officer states the question, then asks those in favor and against to say "Yea" or "Nay," respectively, and announces the result according to his or her judgment. The names or numbers of legisators voting on each side are not recorded.